Sometimes when researching one Hackaday story we as writers stumble upon the one train of thought that leads to another. So it was with a recent look at an unmanned weather station buoy from the 1960s, which took us on a link to a much earlier automated weather station. The restored Kurt in the Canadian National War Museum. 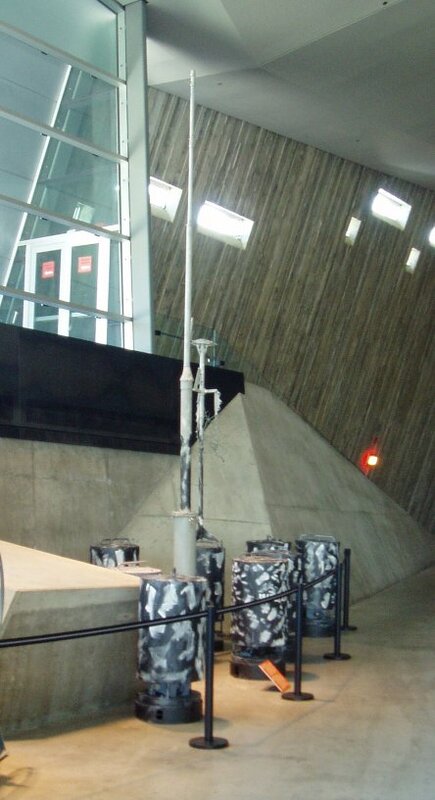 Weather Station Kurt was the only successful installation among a bold attempt by the German military during the Second World War to gain automated real-time meteorological data from the Western side of the Atlantic. Behind that simple sentence hides an extremely impressive technical and military achievement for its day. This was the only land-based armed incursion onto the North American continent by the German military during the entire war. Surrounded as it was though by secrecy, and taking place without conflict in an extremely remote part of Northern Labrador, it passed unnoticed by the Canadian authorities and was soon forgotten as an unimportant footnote in the wider conflagration. Kurt took the form of a series of canisters containing a large quantity of nickel-cadmium batteries, meteorological instruments, a telemetry system, and a 150W high frequency transmitter. In addition there was a mast carrying wind speed and direction instruments, and the transmitting antenna. In use it was to have provided vital advance warning of weather fronts from the Western Atlantic as they proceeded towards the European theatre of war, the establishment of a manned station on enemy territory being too hazardous. A small number of these automated weather stations were constructed by Siemens in 1943, and it was one of them which was dispatched in the U-boat U537 for installation on the remote Atlantic coast of what is now part of modern-day Canada. In late October 1943 they succeeded in that task after a hazardous trans-Atlantic voyage, leaving the station bearing the markings of the non-existent “Canadian Meteor Service” in an attempt to deceive anybody who might chance upon it. In the event it was not until 1977 that it was spotted by a geologist, and in 1981 it was retrieved and taken to the Canadian War Museum. There is frustratingly little information to be found on the exact workings on the telemetry system, save that it made a transmission every few hours on 3940kHz. A Google Books result mentions that the transmission was encoded in Morse code using the enigmatic Graw’s Diaphragm, a “sophisticated contact drum” named after a Dr. [Graw], from Berlin. It’s a forgotten piece of technology that defies our Google-fu in 2017, but it must in effect have been something of a mechanical analogue-to-digital converter. Should you happen to be visiting the Canadian capital, you can see Kurt on display in the Canadian War Museum. It appears to have been extensively restored from the rusty state it appears in the photograph taken during its retrieval, it would be interesting to know whether anything remains of the Graw’s Diaphragm. Do any readers know how this part of the station worked? Please let us know in the comments. Weather station Kurt retrieval image, Canadian National Archives. (Public domain). Weather station Kurt in museum image, SimonP (Public domain). Performing music in open spaces can be a real challenge. The acoustics of the space can play spoil-sport. Now imagine trying to play an instrument spread out over tens of kilometres. The folks at [LimbicMedia] wrote in to tell us about the project they worked on to build the The World’s Largest Musical Instrument. The system consists of wirelessly controlled air horns deployed at remote locations. Each air horn is self contained, driven by a supply of compressed air from a scuba diving tank and battery powered electronics. The wireless link allows the air horns to be placed up to 10kms away from the base station. Each air horn is tuned to a specific note of the piano keyboard which, in turn, is configured to transmit its note data to the air horns. Currently, they have built 12 air horns, enough to let them play the Canadian and British anthems. The horns are built out of PVC piping and other off-the-shelf plastics with the dimensions of the horn determining its note. The setup was installed and performed at the Music by the Sea festival recently, by mounting the air horns on 12 boats which were stationed out at Sea in the Bamfield Inlet in Eastern Western Canada. But that was just a small trial. The eventual plan is to set up air horns all around Canada, and possibly other places around the world, and synchronise them to play music simultaneously, to commemorate the 150th Canada Day celebrations in 2017. There aren’t many details shared about the hardware, but it’s not too difficult to make some guesses. A micro-controller to operate the air solenoid, long range radio link to connect all the air horns to the base station, and another controller to detect the key strokes on the Piano. The limiting issue to consider with this arrangement is the spatial separation between the individual air horns. Sound needs about 2.9 seconds to travel over a kilometer. As long as all the air horns are at approximately the same distance from the audience, this shouldn’t be a problem. See how they did in the video after the break. We do know of another project which handled that problem brilliantly, but we’ll leave the details for a future blog post. This isn’t the first time [LimbicMedia] was commissioned to create audio-visual public installations. A couple of years back they built this Sound Reactive Christmas Tree in Victoria, British Columbia. [REDNIC79] lives somewhere in Canada where key terrain features include mud and snow. Half pontoon boat, half auger, screw-propelled vehicles excel in this kind of terrain as long as you’re okay with going really slow. 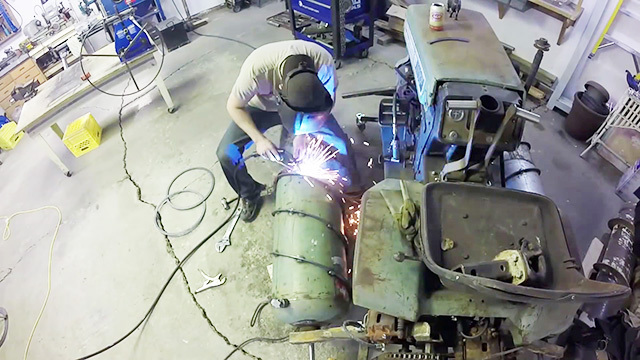 In his 11-and-counting part video series, [REDNIC79] goes through the conversion of a lawn tractor into a slow, theoretically unstoppable, Canadian screw-propelled tractor. He welds a frame, plonks some beefy chains on it, and throws a few hefty looking bearing mounts on there to boot. Then he makes some screws out of gas tanks; which was an enormous amount of work. It was time to fire up the tractor. On the first muddy incline encountered, the tractor ceased to move. The culprit? A cracked transmission housing. Ouch. The end of the shaft holding the chain for the right screw was unsupported. When the shaft turned, it imparted its rotational force, but there was also an unconsidered down force on the end of the shaft, which resulted in a moment the bell housing wasn’t designed for. Undeterred, [REDNIC79] welded the housing back together and threw a bearing on the end of the offending shaft to balance the moments. He fired it up, engaged the transmission, and the right screw bearing pillow block completely shattered. Ouch again. We can safely begin to assume that screw-propelled vehicles see a lot of forces. Tomorrow, April 15th at 7pm, join Hackaday at the Toronto HackLab. Our own Mythical Creature, [Sophi Kravitz] is headed North of the border to talk about all things hardware hacking! As always, we love to see what people are working on in their labs, basements, garages, and workplaces. Make sure to bring your builds with you to show off to the rest of the crowd. [Sophi] will have her Breathe project on hand. Solenoids, balloons, compressed air, and visualizations are the secret sauce behind this clever interactive build. Since there will be snacks, hacks, drinks, and swag we’d appreciate a quick RSVP (use the link at the top of this post) just so we know you’re incoming. Apart from seeing a slew of cool builds there will be lightning talks, some information about the 2015 Hackaday Prize, and if you haven’t been to the Hacklab before this is the perfect time for your first tour. We know there’s a lot of awesome to be seen there!